April was a busy month. First we got all packed and left Fort Lauderdale. Easter weekend we were at an old high school friend’s (Alex) for the weekend along with other high school alumni of Chris’, some of whom are excellent musicians. We were treated to 3 days of music, party, and friends in the beautiful wooded area east of Gainesville, Florida. Alex’s property included a perfect RV site complete with electric hookup! For more details, including videos of the music, see our Blog Post. A Different Kind of RV Rally–Learn about cameras, computers, smartphones and more. We covered so much information at the rally, we’ve decided to use this newsletter just to highlight some of the learning from last week. See the rally’s daily schedule to see all that was covered. Our Techno-Geek Learning rally was a learning experience for us too! We decided to use Facebook’s ‘Page’ feature rather than have a traditional website. It was great to be able to have other people post their pictures and comments as they attended the event. Over the course of the week, over 300 people ‘Liked’ the TechnoGeek Learning Rally page. This meant that we were actually sharing our learning rally with all of them in addition to the people who were actually there. That’s pretty cool! It is so easy to post pictures and stories that the page collected a lot of information in a short amount of time. Any general learning information we tried to post on the main page. Any information specific to last week, we entered on the April 2012 Event page. If you visit that page, be sure to scroll down to the bottom, then click ‘Older Posts’ – you’ll need to do that 3 times to get to the beginning of the rally. The biggest problem we found with using the Facebook page is that you can’t control the layout of the page. When it starts to get full, it can be very hard to find anything. When people post pictures, instead of all pictures going into a photo album, each picture needed it’s own post. And, only official posts by the organizers (us) show up in full in the main column of the page. Other posts are collapsed and stuck in a box at the right. You need to learn to click the tiny ‘See All’ link in order to see what other people are saying. Whether you use a point-and-shoot camera, a digital SLR, or just your smartphone for taking pictures, there are a lot of settings and techniques for taking better pictures. Phil May, from TechnoRV, presented the ‘Getting the Most from your Digital Camera’ seminar on the first day of the rally. Then he took people out on ‘walkabout’ to try their skills with their cameras. One of the prime directives in taking pictures was to ‘get closer’ … no really, I mean GET CLOSER! 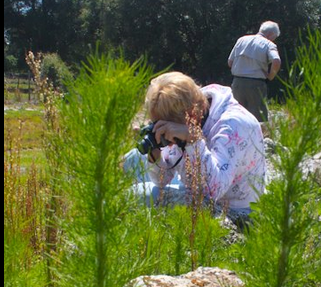 Participants learned about the Macro modes on their cameras as well as fill-flash and scene settings. Then, on the second day of the rally, Chris taught the hands-on class for editing your pictures using Picasa. 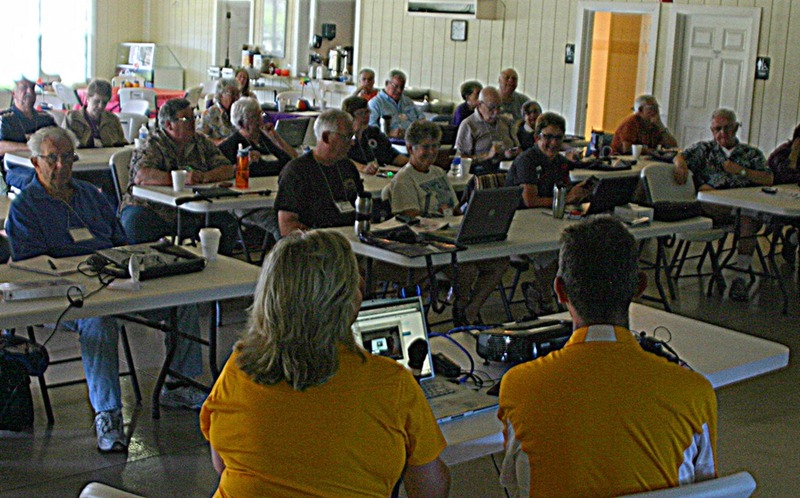 Even people with their Macintosh computers, who were accustomed to iPhoto, attended that class and commented on how many more editing tools were available in Picasa. At Geeks on Tour, we’ve been evangelists for Picasa over 7 years now. It’s a free program that you download to your computer from Google. We teach several seminars on it, produced over 60 tutorial videos, have a website dedicated to Picasa, and wrote a book on it! But, we know it’s not the only game in town. Many people with Macintosh computers are very happy with iPhoto which comes preinstalled on their Macs – even though Picasa does have a fully compatible Macintosh version. On Windows computers, the gold standard photo editing program is Adobe Photoshop ($700!) or Photoshop Elements ($99.) There are also several free programs, including Microsoft’s offering – Windows Live Photo Gallery, and a full featured, Photoshop workalike called GIMP. Everyone at the rally either had a smartphone, or was thinking about getting one. Both Android and iPhones were represented, but Androids were in the majority. 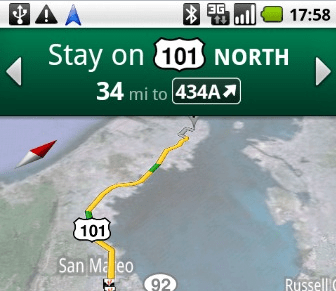 For iPhone users, the most popular navigation app was Waze. Androids come with Google Navigation and we love it! Dropbox, Join.me, Evernote, Megafile and more! After a delicious breakfast, every day of our rally started with a panel discussion. If someone had a question about technology for travelers – any question at all – this is when we answered it. Impromptu topics that got a lot of attention included Dropbox. Both of us (Geeks on Tour and TechnoRV) use Dropbox all the time and we love it. I wrote a previous article: Dropbox-Free Synchronizing Among Computers, and Phil recently wrote Dropbox – the Best little App You’ve Never Heard Of. One morning an attendee wanted to show something on her computer to the group, so we used www.Join.me to connect her screen to one of our computers at the front so it could be displayed thru the projector. Join.me is the free app we use for computer support. With just a few clicks we can see your screen on ours. Evernote is another device-independent application. Use it for taking notes on your iPhone or Android phone, and that same note is available on the web using your laptop or tablet. Although photography related topics was the bulk of our rally, some people said that learning about the Streets and Trips POI Megafile was worth the price of admission. The megafile was just updated in April. For our members, here’s the video on using the POI Megafile. I also notice there is a video you can watch on the Streets and Trips blog. At the rally, we were able to help people hands-on install the megafile on their computer and even set it as their default template for Streets and Trips. There was a lot more … if you attended the rally and learned something that I didn’t mention here – please leave a comment ok? only $58/yr= access to ALL videos plus the Forums. Published by MrsGeek, in Newsletter. Tagged with Facebook, Geeks on Tour, Photography, Smartphones, TechnoRV.